It's the lifeblood of pantries around the world, the go to dish when you're down (and when you're up), the food of champions, families, students and Michelin starred restaurants... yes, you guessed it, we're talking Italy's beloved pasta. If you're Italian, or a pasta purist, there's a lot to know about pasta, from the different shapes to matching the right sauces, and that's before you nail the al dente cooking. With several hundred varieties of pasta to choose from, from long to short and everything else in between, being on first name terms with pasta, outside of the usual favourites, is something of a memory and recognition challenge. We take the guess work out of it with these six visual guides that give you all the need to know names of pasta along with serving suggestions, plus a video on how to make homemade pasta straight from the Simili sisters themselves. This guide serves as a great starting point for learning the basics on matching pasta names with shapes, along with the right weight of sauce to pair that'll take you to pasta heaven. Become a pasta boff with these top facts to impress your fellow pasta lovers. 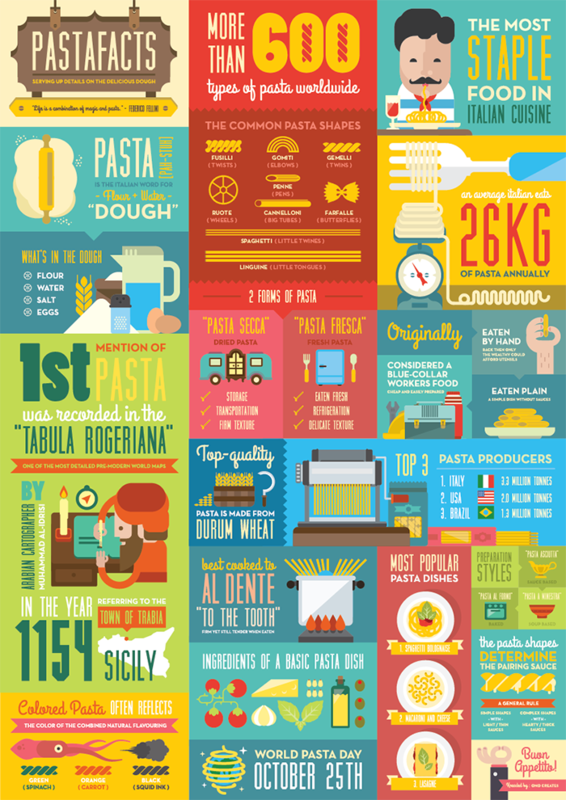 With over 600 types worldwide there's a lot of pasta out there to discover. And no prizes for guessing which three pasta dishes are the most popular. Ever been served up a dish of pasta only to not know what it actually is, or wanted to try it again but didn't know what it was called. 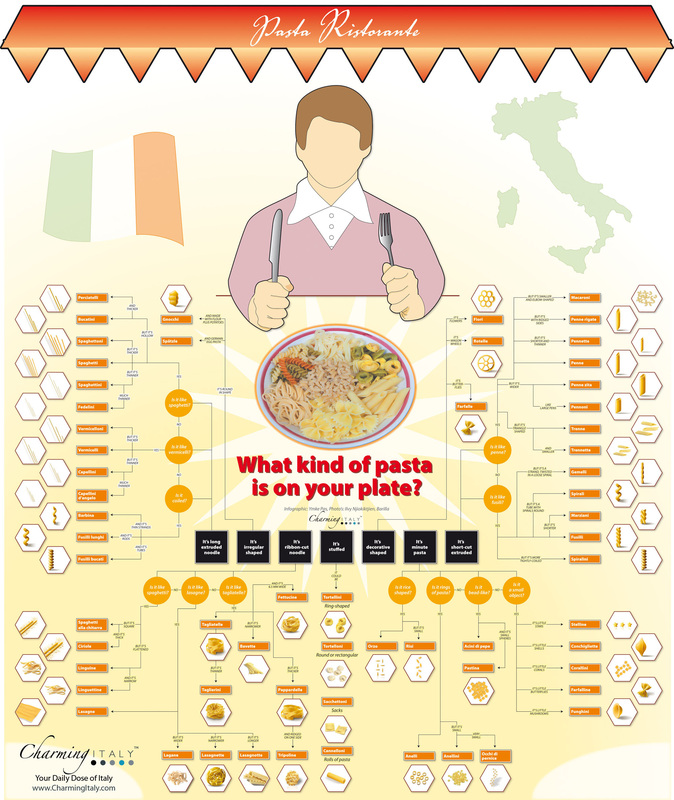 Here's a neat process flow helping you to identify what that pasta on your plate in a restaurant by working backwards through a question tree. 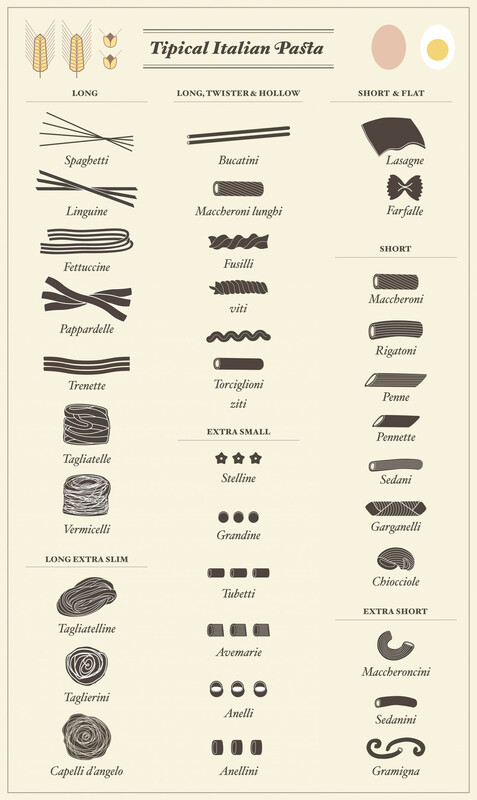 This is a great quick reference guide for when you need to navigate your way through the complicated world that is Italian pasta names. 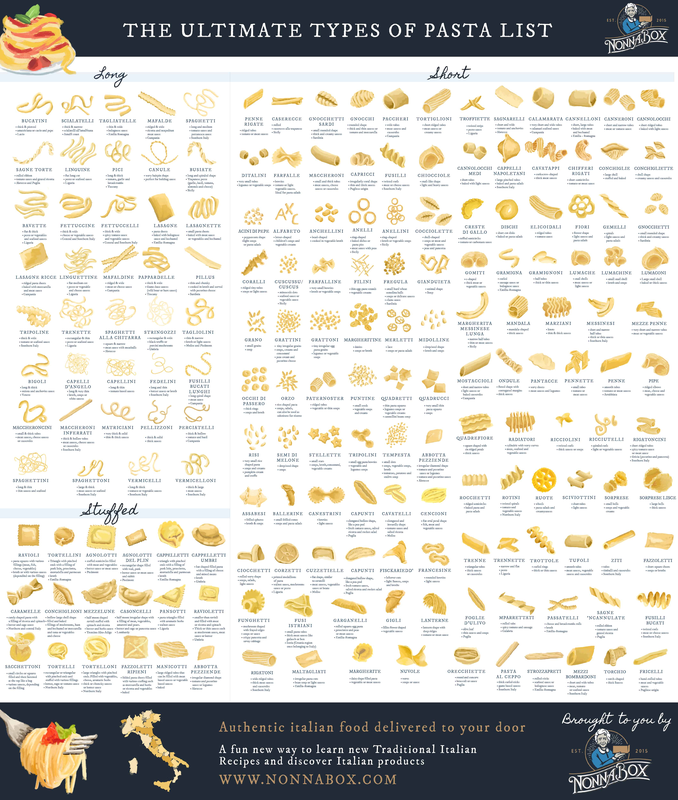 If you want to go all out on your pasta knowledge this is the ultimate go to guide. The clear, pictorial layout bunches different types of pasta together in 'pasta families'. A great guide to keep on your wall, or experiment when you fancy throwing a few new shapes into the mix. Take a tour around Italy in pasta shapes and learn the origin of the pasta and how it was given its particular name, from the butterfly farfalle to the little spindles of fuissili. If all that talk of pasta has made you hungry why not try making your own at home. Here's the simili sisters to help you.